With just word of mouth, we had roughly 600 unique visits in the first two weeks. Thank you for your interest in the KommerceServer eCommerce Suite for Eclipse. KommerceServer webStoreFront enables you to expand your market reach, boost online sales and compete more effectively in the global market while you connect with customers and collaborate with partners. webStoreFront is designed for manufacturers, distributors, and retailers with features that support both business-to-business (B2B) and business-to-consumer (B2C) environments and it's integrated with your Eclipse ERP application and UniVerse database to provide a comprehensive eCommerce solution that is modern looking, highly-functional and cost-effective. KommerceServer webStoreFront is designed to integrate with your Eclipse MultiValue application and it's powered by Microsoft SQL Server and .NET technologies, so you will enjoy top performance and scalability without affecting the performance of your Eclipse ERP system. Give your customers 24/7 secure, self-service access to their order status, order history, in-transit shipments, invoices and more with the available KommerceServer webPortal. This enterprise customer information portal provides a complete view of information that originates from the webStoreFront and from your Eclipse application. 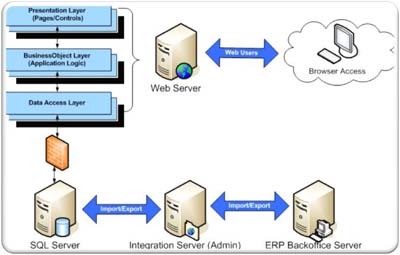 KommerceServer webStoreFront is designed for integration with MultiValue back-office applications like Eclipse in order to provide key information for the storefront such as: customers, parts, prices, etc. Visit the KommerceServer Home Page for more information.